VATICAN CITY (CNS) — God’s love is never lacking, despite people’s sins and rejection of his presence in their lives, Pope Francis said at a Lenten penance service. “Sin is the way that we distance ourselves from him. Yet that does not mean that God distances himself from us. The state of weakness and confusion that results from sin is one more reason for God to remain close to us,” he said March 9. The penance service in St. Peter’s Basilica marked the start of the worldwide celebration of “24 Hours for the Lord,” a period when at least one church in every diocese was invited to be open all night — or at least for extended hours — for confession and eucharistic adoration. After delivering his homily at the service, Pope Francis walked to one of the confessionals in the basilica and knelt in front of a priest to confess his sins. 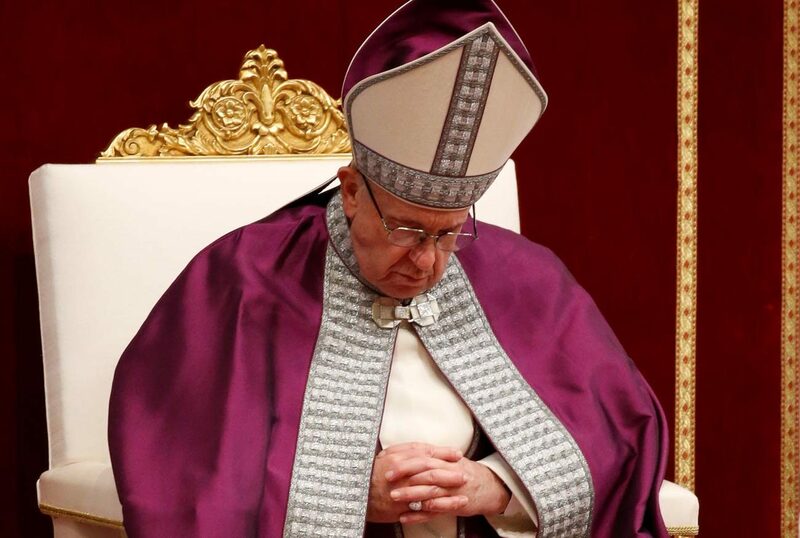 Then he went to a confessional, put on a purple stole and waited each penitent to approach. He heard confessions for one hour. Dozens of other priests were stationed in other confessionals, or chairs in quiet corners, to hear confessions. “His is an infinite love, one that knows no bounds. It is free of all those obstacles that we, for our part, tend to set in front of others, out of fear that they may strip us of our freedom,” the pope said. That hope of receiving God’s grace is what guides people back, when “our life has lost its direction,” as it did when Peter denied Christ three times. Realizing the immensity of the Lord’s love for him, Peter finally lets himself be loved, he said. Peter “had always refused to let himself be saved by Jesus alone, and so he did not want Jesus to love him completely,” the pope added.